Welcome to Steyrhaus German Shepherds. We are a small kennel residing on a two acre lifestyle block in Manawatu, New Zealand. All our German Shepherds are part of our family. Margaret has been involved in German Shepherds since 2014 and Neil has been actively involved as an owner, breeder and exhibitor for over 15 years. 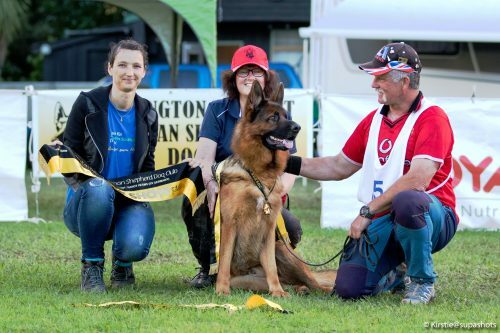 We are members of the New Zealand German Shepherd Dog Advisory Council; Wellington District German Shepherd Dog Club and also particularly involved in the German Shepherd Dog Association of Hawkes Bay as both members and committee. We strive to maintain the intelligence, temperament and health of all our German Shepherds. All our breeding stock have a minimum of ‘A’ and ‘Z’ hips and elbows passes which means they are considered to have low risk of passing on hip or elbow issues. Thankyou for taking time to visit our site. If interested in a puppy please send a puppy request. Additionally please feel free to add a comment in the guestbook.